bought C his big boy bedding already?! It was on sale and I just couldn't resist. Husband is a huge baseball fan and we both thought this would be perfect for our little man. And yes, we got the American League. Have to represent those Rays!! 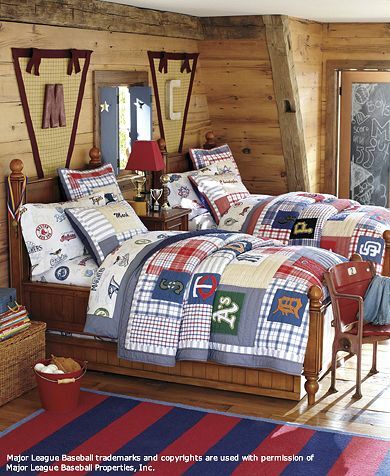 We knew we wanted a baseball theme but had no idea that I could find something so cute. Of course its from Pottery Barn Kids. I have no idea what I'm going to do with it for another 6 months to a year but at least we have it. What I hate about Pottery Barn is that you find something you love and then you will go back months later and its sold out or not around anymore. That's why I decided to grab it now. Its a great idea!!! Love the bedding!!! You're smart to buy it now - you hit the nail on the head when you said that PBK items disappear on you! It's happened to me a time or two. how adorable!! nice job on finding a sale! i was in shock when it was already time to get sophia a big girl bed...but she loved it. :) girl i just have to tell you how encouraging you have been to me during this hard time. your comments have been so uplifting. it's so beautiful to find someone in the bloggy world who is so faith filled. I have been amazed with the outpouring of prayers and love from so many of you.